Exhibits, Displays & Murals - Light-Works, Inc. Producing graphics for point of sale display or exhibition must be timely, consistent, durable, and top notch quality. That’s what we at Light-Works have been striving for since 1978. Our respect for the photograph and exceptional design shows in our displays at museums, public spaces, trade shows, and airports throughout North America. We do everything to produce the result you want and can offer flexible solutions for printing custom wall murals that will make you stand out. We provide customized solutions, using our years of experience and expertise to ensure your exhibit is stellar. Custom exhibit display graphics are usually a combination of images, content and design. They must communicate clearly and consistently, hang properly, and be durable. This requires both close communication and knowledge of current processes and available materials to find the best fit for your application. This is what we do. At Light-Works, we print directly to panels to provide a more lasting exhibit, eliminating delamination, and bubbling. the duration of the exhibit (will the materials be reused in the future). the viewing distance; this helps with image resolution requirements. will the graphics be in high or low traffic areas? will they be affected by excessive sunlight, heat, humidity? the size(s) included desired thickness / quantity, number of originals. will they need custom cutting (shapes)? how will they be hung or installed? do you have existing specifications, plans, or drawings? Light-Works has been chosen to produce the graphics for the State of Vermont Visitors’ Centers for over 20 years. 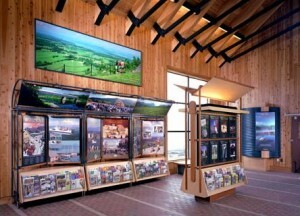 In 2016, we printed, laminated, and installed several very large photographic murals (in excess of 17 feet in width) in the new Visitors’ Center in Barre, Vt. The murals, all by local photographers, were printed on our Arizona roll printer on 3M Control-Tac, and installed by our staff. The Center also required indoor and outdoor panels direct printed on aluminum and clear coated.